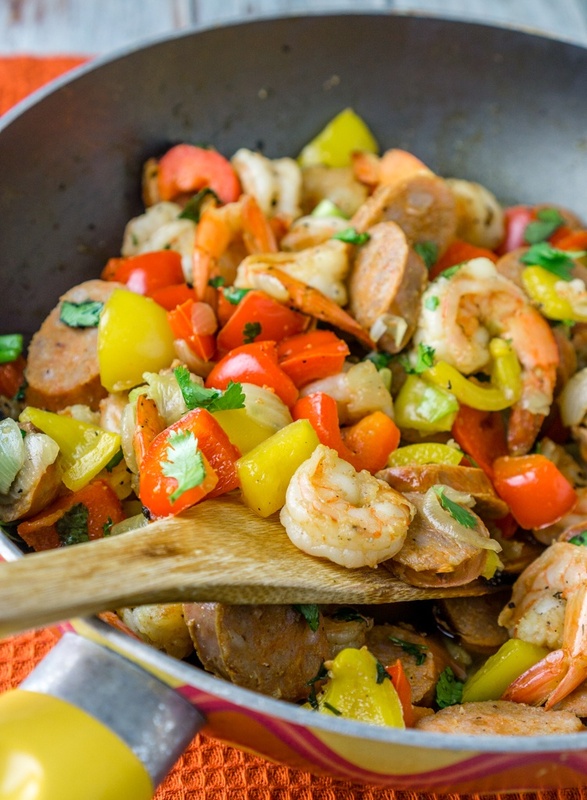 Get this 20 minute recipe for the 4-ingredient Sausage & Shrimp Skillet. Super delicious and easy for a quick weeknight dinner! Prepare all the ingredients: Chop the onion. Chop the bell pepper into 1/2-1 inch pieces. Slice the sausages into 1/4 inch pieces. Heat the olive oil in a large frying pan or wok. Add the chopped onion and saute for 5 minutes, or until the onion softens. Add the bell peppers and shrimp and saute until shrimp is fully cooked, about 3 minutes. Add the sliced sausage and stir to heat through. Remove from heat and garnish with fresh herbs.